This is the first year I haven't gotten tickets to BDO & soundwave since I was 17. 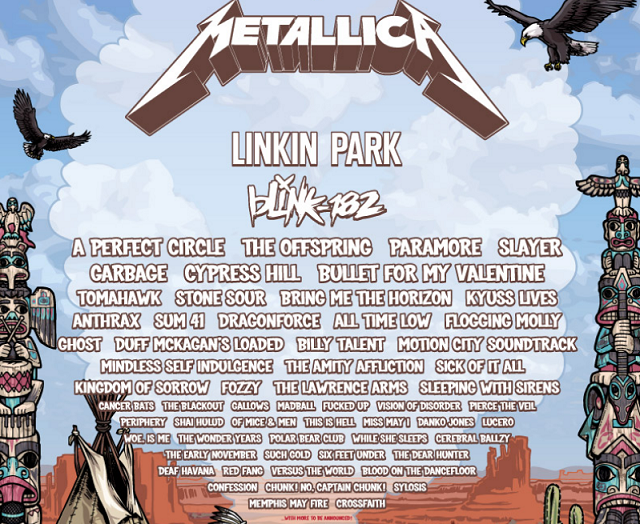 I've seen most of these bands a few times now apart from Linkin Park (who I wasn't too fussed over seeing) and Blink 182 (but knew it was almost certain Travis would drop out). Hopefully I can plan a US trip to go see them instead! I hope you have a fantastic time today! I'm sure you will, there's so many awesome bands to see! My favourite gig was Simple Plan last year - they played without Pierre (the lead singer) and there was about 20-30 other people in the room. They only played a couple of songs but I was standing right in front of my favourite member David and it was just fantastic. We had to sing most of the lyrics because they couldn't remember them because they never do the lead vocals, haha. Then we got drunk for free because we had waited all day and the gig got cancelled because Pierre wasn't there, and then we got to do a meet and greet with them. And we got a refund. But it was the best! You're so lucky you got to go! I really wanted to see Paramore & All Time Low but everyone else would have been amazing, too.